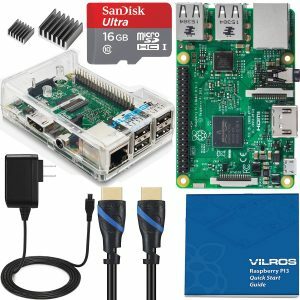 Update: All the starter kits mentioned in this list come with the latest and advanced Raspberry Pi 3 or Raspberry Pi 3 B Plus Single Board Computer. Raspberry Pi 3 b+ is the latest one in the market and it lives up to the expectations that all users had with it. It is faster and it is smarter than all its predecessors. It also comes with so many different properties that you’ll be thrilled to use it! If you have just started out, you might want to first learn about Raspberry Pi in detail before we understand why Raspberry Pi 3 is the rage right now. You can plug it into your monitor or PC and use it with the help of a mouse and a keyboard. You can browse the Internet, stream videos, watch movies, and listen to music just like you would on any full-fledge computer. You can also play games, make spreadsheets, and more. You can learn programming languages such as Python and Scratch using Raspberry Pi. You can use it to run various operating systems including Debian Linux OS and Windows 10. From CanaKit, you will get a premium Raspberry Pi 3 B Plus starter kit at an affordable price. This latest Pi 3 B+ package includes all the components and accessories that can help you to finish your electronics as well as robotics projects. If you want to explore the world of Raspberry Pi, then get this CanaKit RPi 3 B Plus kit today. From making a media center to a web-based server, from a simple desktop computer to a high-end retro gaming console; all can be done quite easily with this kit. 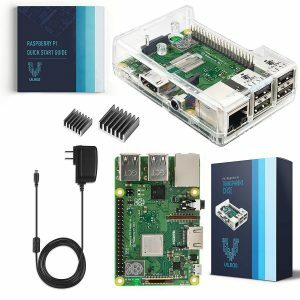 Another famous company, V-Kits by Vilros offers the Pi lovers a basic Raspberry Pi 3 B Plus starter kit. It provides a great value and configurations that can help you to finish your multiple Raspberry Pi projects with learning & fun. V-Kits by Vilros tried to provide everything, especially for the Raspberry Pi beginners, at a relatively low price. This basic Raspberry Pi 3 B+ kit from V-Kits by Vilros comes with almost all the essential accessories accept a Pi compatible Micro SD card. So, you will need to buy it additionally. The other features that are offered by this kit at such affordable price is a boon for the RPi lovers, though. A premium case that comes with integrated camera support. A 32 GB class 10 MicroSD card with the operating system already pre-loaded (NOOBS). A MicoSD USB reader that you can use to load any other OS onto the card. A 2.5A power adapter designed especially for Raspberry Pi. A 6.5 feet long HDMI cable thanks to which you can control the Raspberry Pi using a CEC compatible TV’s remote. A quick-start guide to help you through the entire setup process. It has a 1.2 GHz 1 GB RAM. 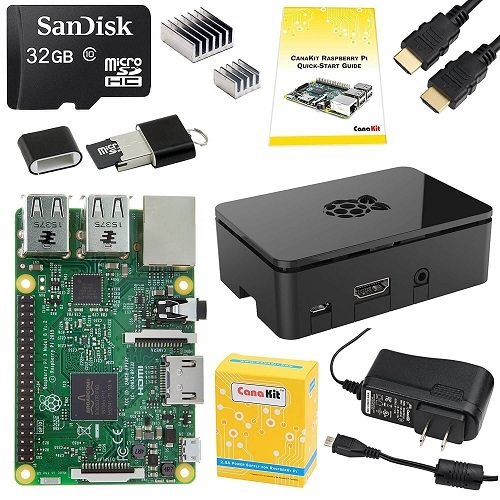 Users say that it is the perfect starter kit for every Raspberry Pi enthusiast. It has built-in Wi-Fi and Bluetooth. Many users have also said that the kit is a steal at that price when compared to the other options. The included noise filter makes usage super easy and comfortable. The brand offers 1-year manufacturer’s warranty. We used this kit and many of its counterparts, and we think it really is the best one out there especially at the price. The entire kit is so simple to use, you won’t feel like a first timer even if you are one. Like the Canakit, Vilros has included this Raspberry Pi 3 starter kit on sale, and soon hundreds of tinkerers bought it. The Raspberry Pi 3 and all other components come in a clear & sturdy case. The company gives a one-year manufacturer warranty for all the parts and accessories of the kit. 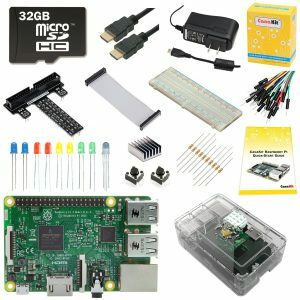 If you pick this kit up from Amazon, you will be on your way to a superb Raspberry Pi 3 experience. This kit is designed to help you take off even if you are a beginner. It comes with a very secure case that is actually the official black Raspberry Pi 3 HAT case that’s also quite functional. It aids easy assembly. The kit also includes a 16 GB class 10 MicroSD with pre-installed NOOBS (New Out of Box Software) for Raspberry Pi. 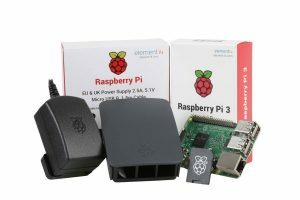 The brand is also offering a complete Raspberry Pi recovery system. In the kit, you will also find the official Raspberry Pi 5.1V 2.5A power supply. The plug is interchangeable. The heads can be changed based on your convenience. So, whether you have a 2-pin plug (US) or the one with 3 attachments, this one will work for you with ease. Remember that HDMI cable is not included in the kit. You will have to buy it separately along with a USB SD card reader if your work requires it. It offers 4 USB ports. It comes with a 2 GB RAM. Users vouch for this product not just because it is an official kit from the makers but also because it is highly affordable. The included troubleshoot sheet is a bonus for the tinkerers. With the help of it, you can check for the reasons and solutions for the most common problems with the Raspberry Pi setup and usage. 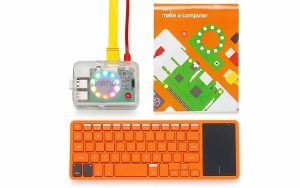 If you want to make your own computer without breaking your pockets, then go for this Kano computer kit. It is powered by the fastest Raspberry Pi 3 board. You just need to watch the story, attach the parts, and then see its working like a wonder. The famous electronic kits producer – NeeGo designed this complete Raspberry Pi 3 starter kit, especially for the beginners. It comes with a super-powered micro computing Raspberry Pi 3 machine which helps you to implement your electronic circuit designing ideas in reality. The Neego Raspberry Pi 3 kit helps to learn circuits, robotics, to enjoy games, media, to use a digital office tool, to take pictures, to record videos, and to do much more other things. Education with fun, tinkering with entertainment is what the goal of this bundle.It is achieving it quite comfortable also. The OSOYOO has designed this 22 in 1 starter kit especially for beginners with Pi 3 circuits. 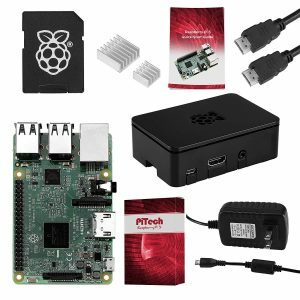 If you want to learn and implement the Pi DIY projects in your home lab, then this learning lab kit is recommended for you. Other accessories that come in this pack are a 40 pin ribbon cable, GPIO extension board, breadboard, one channel relay module, one servo motor, different sensor modules including pressure, temperature, infrared, & humidity, potentiometer, infrared remote controller, jumper wires, and other essential components. 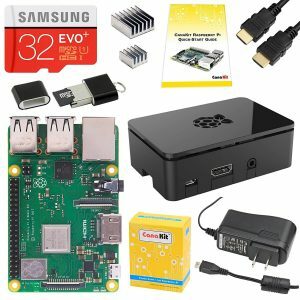 When we talk about the Raspberry Pi kit, then we must mention this ultimate bundle from CanaKit. Here is the set of all the needed components for your electronics and robotics projects. As it has genuine parts and accessories, you will not have to worry about its quality and durability. Now, with so many Raspberry Pi 3 options in the market you are probably confused about the bets one. Keeping cost, performance, requirements, and ease of use in mind, we would definitely recommend the Canakit Raspberry Pi 3 Complete Starter Kit. Have you used it yet? We want to hear your experience! 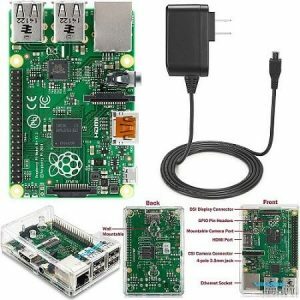 How to get the best Raspberry Pi 3 kit? It all depends on your particular project needs, knowledge, and of course, your budget. But, I want to mention here that, any project you are going to make, the overall amount will not exceed to 100 bucks, most probably. I am always in a look of adding latest and best kits for Raspberry Pi 3 to provide you an excellent choice for your electronic projects. The bundles mentioned in the list above are recommended for both the beginners as well as for the experts in electronics and robotics. Whether you want to start with an easy peasy experiment or want to have an extra flavor in your project with Raspberry Pi 3, these kits will not make you regret choosing them. I am waiting for the helpful thoughts and suggestions from you. You can share your ideas and inputs through the comment section below or from the contact form. I will be happy to hear from you. Let me know which kit you liked the most and how it was helpful in your Raspberry Pi project. Help your friends and other electronics enthusiasts to make the best use of these kits for their innovative projects by sharing this list. How to setup Raspberry Pi 3? So, you got your favorite Pi 3 starter kit and now going to implement your project idea. But wait a second. How the heck will you start designing the project without setting your Pi up? Do you know the setup process? If Yes, then it’s good and goes for your design, but, if the answer is no, then you should check this quick guide below to setup your favorite Raspberry Pi 3 board. Note: If you bought the best Raspberry Pi Starter Kit, then you do not need to purchase the above tools separately, as the kit includes them all. Every Pi starter kit comes with a preloaded NOOBS SD card. But if you are purchasing a separate component, then make sure you buy the one which is NOOBS ready. With the help of NOOBS SD card, install Raspbian OS by downloading the official image from the official website. Format the SD card in the FAT type. Depending on the system you use, i.e., Windows or Mac, there are tutorial available on the web if you don’t know how to do this. Now, extract the content of the downloaded zip file and save it on the memory card. Once done, eject the SD card and insert it into your Raspberry Pi 3. USB powered devices like keyboard, mouse, etc. First, select your regional language and keyboard layout you want on your Pi. Then choose ‘Raspbian’ from the list and click on ‘Install’ button. After few minutes, the NOOBS will finish the installation. Then the system will restart automatically, and a Raspbian Desktop will appear on the screen. Now, it’s the time for configuration. You will see a Menu on the top-right corner of the screen. Click on it and select the applications like web browser, documents, games, etc. you want to run on your OS. Set up a WiFi network and Bluetooth connection after the OS gets running. Just like you do with other Operating Systems like Windows, you can set the WiFi connection on your Raspbian OS. Click on the Internet network icon on the top-left of your desktop. From the list of names, select on the WiFi network you want to connect with. Enter the credentials and click on Ok button. If you are using the USB WiFi adapter for the internet, the method will be the same. Now, to connect Bluetooth devices, click on the Bluetooth icon on the top-left side of the screen. When your Bluetooth enabled device shown on the screen, choose it and then follow the pairing instructions. Surprised? But it’s true. You can use your Raspberry Pi remotely without any additional display. If you have a desktop or laptop PC at home, then you can connect your Pi to it and then use its OS environment on your own PC. Through the Virtual Network Computing (VNC) or an SSH command line interface, you can make this possible. So, by following the above steps, you can quickly setup your Raspberry Pi 3 board. If anything goes wrong or you entered false details, then don’t worry and repeat the steps above.